A coloured map published by Laurie and Whittle in London in May 1798. It shows County Carlow with its Baronies, the town of Carlow with Graigue and other towns and villages. It also shows important physical features such as the River Barrow. The surrounding Counties are also indicated. A scale of miles is shown in the left hand corner. The Baronies as shown in this map do not fully represent those which made up the Carlow Poor Law Union. For instance, the three parishes from the Barony of Slievemargy (in Co. Laois) are omitted. 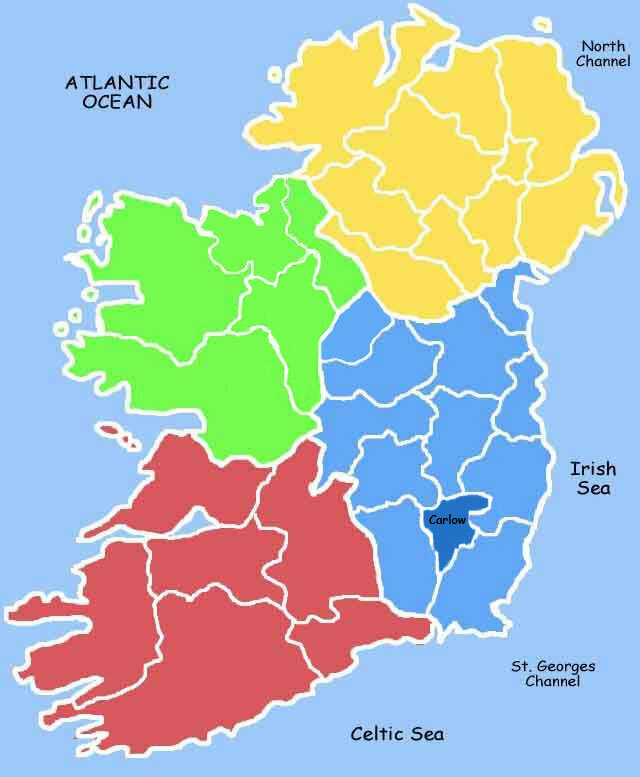 Map of Ireland outlining Carlow. It is surrounded by five other counties and does not have a coastline. The Barrow is a major river which runs through the county. 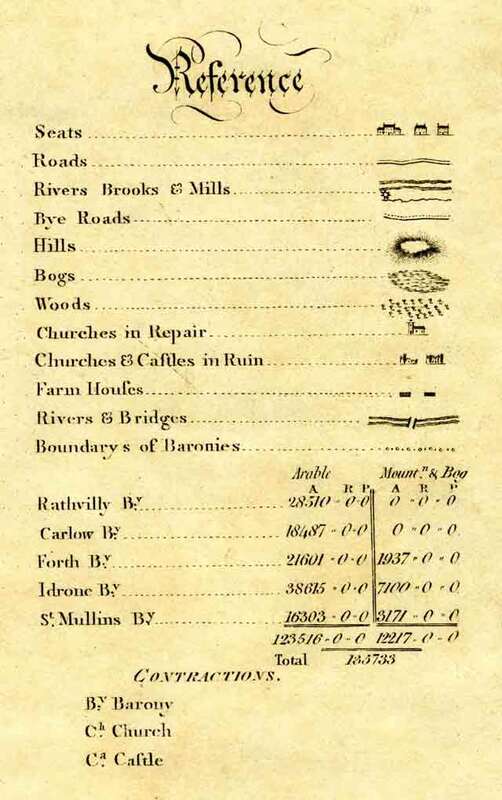 This detail from the Grand Jury Map of Carlow shows the map legend. The legend appears at one edge of the map. It explains what the various symbols on the map mean, how different kinds of roads are shown and lots of other information to help you read the map. 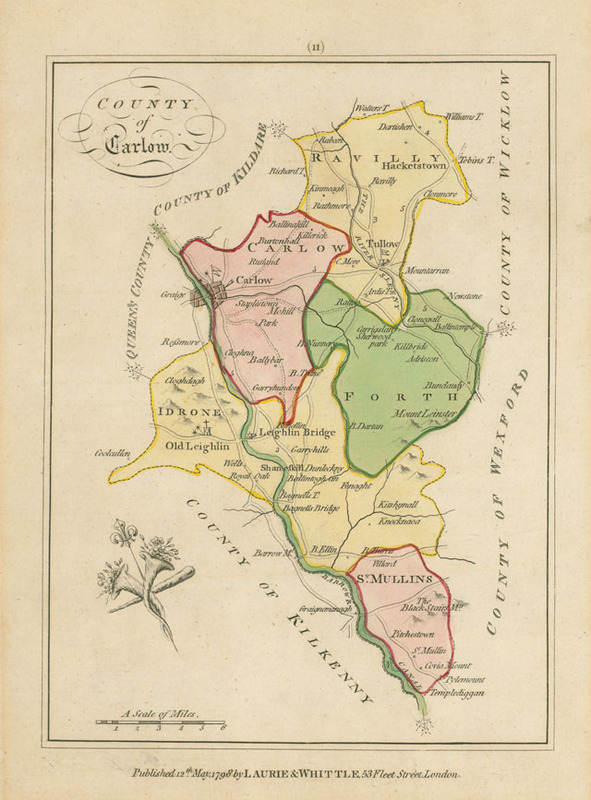 1798 Map of Carlow. This map shows detailed information about Carlow and shows the postion of the surrounding counties. 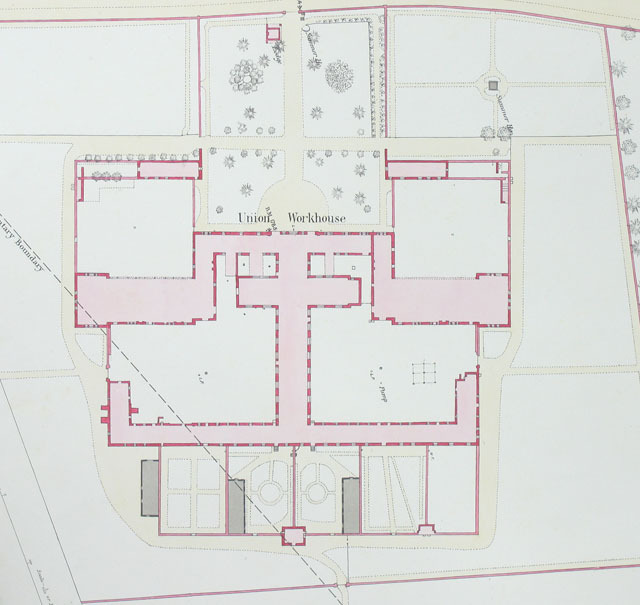 Plan of Carlow Union Workhouse from Ordnance Survey Map, sheet 25 surveyed in 1873 and zincographed in 1875, under the direction of Lt. Col. Wilkinson (not listed on sheet 25). The scale of map is 10.56 feet to 1 mile. The detail of this building is enhanced by use of colour. Entrance from the Kilkenny Road shows central path bounded by grass and scattered trees. A lodge is situated to the right of the entrance. The symmetrical plan is clearly identified on the map. Part of the Parliamentary Boundary can be seen passing through gable on left hand side of map, and to the County, Barony and Parish boundary along the centre of the River Barrow.